DJ, Marlon Flohr, and producer, Ralph van Hilst, who together form Bassjackers, are perfectly in sync as a duo. Their opposing personalities – Marlon being the wild one rocking each and every stage they play and Ralph the more cool and collective preferring to shine behind the scene on the producer seat, are a perfect combination for this unique one dj-one producer collaboration. The duo exploded onto the scene and in 2011 their dancefloor bomb “Mush Mush” was picked up by Tiësto and released on his label Musical Freedom. The track dominated the Beatport top 10 chart for over two months and was one of the biggest festival tracks of the year. This was a sign of things to come. 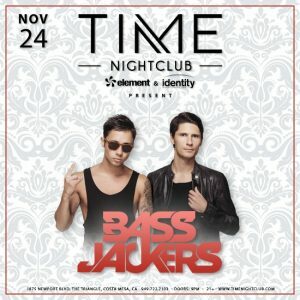 Since then, Bassjackers have reached massive new heights in their career with numerous chart-topping bangers and hit collaborations with the likes of Martin Garrix, Afrojack, KSHMR, Dimitri Vegas & Like Mike, R3hab, and Showtek, to name a few, as well as remixes for A-list artists including Rihanna, Enrique Iglesias, Moby, and Ne-Yo. At the top of their game, Bassjackers continue to tear up stages worldwide and wow crowds along the way.